An exploration of Harlem's past and present through the eyes of the people who live and work there. In 2011, broadcast journalist Melvin McCray created the Digital Media Training Program (DMTP) to train underserved youth in video, photography, 3D animation, computer programming, engineering, and journalism. The DMTP’s Youth Empowerment Television (YET) began at the New Explorers High School in the Bronx in the fall of 2016. YET enables 7th through 12th graders to produce non-fiction film projects that express their reality and vision while developing their collaborative, communication and critical thinking skills. In addition, the program features their projects on broadcast media, in public screenings and online exhibits. On June 13, 2018, students at the New Explorers High School presented their Spring Dance Showcase under the artistic direction of Jess Lewis. Video production was provided by the students of the video journalism class. 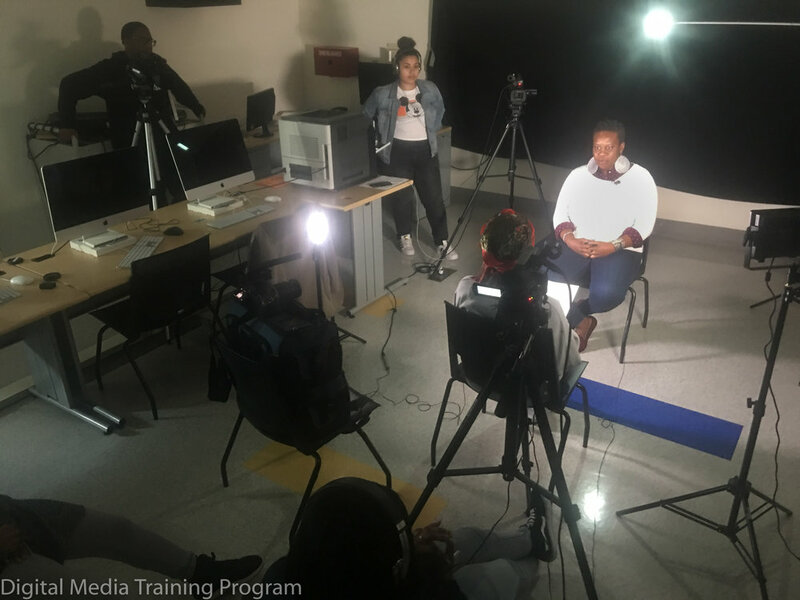 Therapist Kyndra Frazier (center) and Instructor Melvin McCray with students of the video journalism class. Kendra Frazier being interviewed by student reporter Aryon Holley. Gwen Carr, the mother of Eric Garner, at the New Explorers High School video journalism class. Columbia Medical School Psychiatrist Dr. William Tucker being interviewed by student reporter Chivonne Ross. Community Activist Keith Pope (left) is being interviewed by student reporter Tyrek Robinson. New Explorer High School student operating a video camera. New Explorers High School teacher Joann Mariani, MetroFocus Host Jenna Flanagan, Youth Empowerment Reporter Aryon Holley, Dancer/Choreographer Jinah Parker and Digital Media Training Program Director Melvin McCray at an in-studio taping January 26, 2018. See MetroFocus. Journalism Instructors Joann Mariani and Melvin McCray (far left and far right) assist New Explorers High School students at the conclusion of an interivew with Photographer Janette Beckman (center). Photographer Janette Beckman being interviewed at New Explorers High School with student Aryon Holley on camera. On October 27, 2016 students at the New Explorers High School filmed their fellow students in a performace of Ghost Busters and Michael Jackson's Thirller. The dance presentation is presented yearly and was choreographed and directed by Ms. Sedlack, a dance teacher at the school. New Exploeres High School students created a video featuring their favorite Obama Moments. The film was presented to the White House Office of Digital Strategy for inclusion in their online video campaign. Aminata Kane at Costume and Couture class at Fashioin Institute of Technology, a division of the State University of New York. The purpose of this site is to publicize a multi-media project exploring Harlem's past and present told by the people who live in the community. The project is called Harlem Through My Eyes and it utilizes video oral histories, photography and animation to tell the story of this world famous community. It is being created by a group of students ages 14 to 21 under the tutelage of Melvin McCray, program director, of the Digital Media Training Program at MIST Harlem.